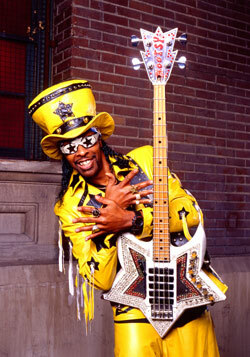 The legendary Bootsy Collins is celebrating his 65th birthday today. The bassist behind James Brown, Parliament Funkadelic, and countless others is known for his driving bass grooves and humorous vocals that have given him a staple name in the world of funk. To celebrate the Rock and Roll Hall of Famer, we’re taking a look back at some of our favorite Bootzilla videos. Fans of Bootsy Collins are hip to his Rubber Band, whose single “I’d Rather Be With You” from Stretchin’ Out in Bootsy’s Rubber Band will always come to mind. Enjoy this particularly funky version from a live concert in Houston, Texas in 1976.